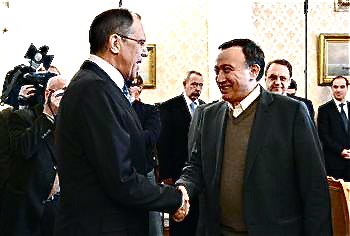 Haytam Manna' (right) who met Lavrov in Moscow March 11 is now in the U.S. The oscillating compass needle of Washington’s Syria policy stabilized this week on seven signals. Raghida Dergham today lists the other six in her weekly think piece for pan-Arab al-Hayat. So let me start with hers. 2. A preemptive blow to the GCC partners in the countdown to the March 26-27 Arab summit in Doha after the Saudi-Qatari push to describe Assad as having lost his legitimacy and chosen to destroy the country in order to hang on to power. 3. A submission to the Russian position that Assad is a “red line.” The hope is that Kerry’s concession to the Russians will be counterbalanced by concessions they can win from the Syrian regime. 4. A dawn of contradictions, rashness or a distribution of roles involving the United States, the United Kingdom and France. Kerry designating Assad by name as kosher interlocutor is irreconcilable with the positions of his British and French counterparts and allies in the UN Security Council. Kerry’s position is equally at odds with Hillary Clinton’s. 5. A shot in the arm to the mission of Syria troubleshooter Lakhdar Brahimi, who wants to dissociate the Assad Gordian knot from the commencement of dialogue and negotiation. 6. A pull of the rug from under the Syrian National Coalition’s feet in that Kerry’s bolt out of the blue risks splintering SNC ranks and forcing the resignation or dismissal of its leader Moaz al-Khatib. Within 72 hours of his talks with Russian Foreign Minister Sergei Lavrov in Moscow, Syrian dissident Haytham Manna’ – who is outwith the SNC and is a strong critic of the Free Syrian Army -- landed in the United States for presumed talks with its National Security Council and State Department officials. MS. NULAND: (Sneezes.) Excuse me. Q.: -- that will be in town later this week, or maybe next week, with – headed by Mr. Manna’. Any meetings they are holding here at this building? MS. NULAND: This is a different Syrian opposition group, or this is some – or representatives from the SOC [Syrian Opposition Coalition]? I’m not sure I know which meeting we’re talking about. Q: He – no, no. Mr. Manna’ is not with the SOC. MS. NULAND: I will have to check on that one. I don’t know about that meeting. Q.: Is there a delegation of the SOC? MS. NULAND: No. We haven’t yet, as we said yesterday, set dates with them for their visit to Washington. Q.: I just wanted to follow up. Are you in contact with Mr. Haytham Manna’? He’s a quite a national figure in Syria – resides in France, I think. MS. NULAND: I would guess that Ambassador Ford and his team do have contact with him. If that is not the case, we’ll let you know. A delegation of Syrians will be visiting New York on March 13-15 and Washington on March 17-20 in pursuit of peace. The delegation, associated with The Democratic Civil Alliance (DCA) that emerged as a follow up to the “Geneva Declaration” of January 29. It represents a broad coalition committed to non-violence, democracy, pluralism and non-sectarianism and unites around a clear political plan for a negotiated solution in Syria based on the Geneva Communiqué of June 2012. Delegation members are seeking meetings with policymakers, experts, diplomats, UN staff, media and NGOs. The DCA, considered to be one of the largest and most influential within Syria, brings together well-known Syrian human rights activists, professionals, political parties, and civil society groups, many of who have worked within the National Coordination Body for Democratic Change and Building The Syrian State current. Sharply critical of the dictatorship of Bashar al-Assad and his violent repression, these Syrians are also critical of the increasingly militarized rebellion, the foreign arms flowing to both sides of the military conflict, and the Islamic fundamentalist influence within the rebel military forces. The Democratic Civil Alliance brought together all these forces around very solid and clear plan for negotiated political solution. They are reaching out to all Syrian players, political, civil society or even military players to join this alliance to find a safe solution for the country that puts an end to the violence that started spilling over the borders and is forming the perfect nurturing environment for extremism. The mainstream international media tend to ignore the large secular and democratic movement within Syrian society and the complex multi-religious and multi-cultural nature of Syria, where there is broad opposition to a post-conflict Islamic government and fear of reprisals and of ongoing conflict after the fall of the dictatorship. The delegation reflects this perspective and aspires to find the broadest international support for its political plans. The three-member team has important political roles in the Syrian internal political scene. Dr. Haytham Manna’ has been a Syrian human rights advocate for over three decades. Manna was born in Syria and studied medicine at the University of Damascus. He now lives in Paris where he practices medicine and is the lead external spokesperson for The Democratic Civil Alliance. He has won awards for his human rights work from, among others, Human Rights Watch and the U.S. National Academy of Sciences. He is co-founder of the Arab Commission for Human Rights and has served in leading roles in several other human rights organizations. He is the president of the National Coordination Body for Democratic Change in exile and the vice-president of the Syrian-based branch of the organization. She is an Astrophysicist at the Imperial College in London and is a specialist in the history of Arabic/Islamic science and its influence on the West. She has published many papers and books both on scientific and historical topics. She is the founder and co-chair of The Damask Rose Trust, a UK-based charity that supports development and education in Syria. James Paul, senior advisor at Global Policy Forum and author of Syria Unmasked (Yale Press), and Mel Duncan, advocacy director of Nonviolent Peace Force, will host the visit. Both attended the Geneva Conference on Syria in January.